Dubai ranks among the top 20 cities globally for the ultra-wealthy. What does this mean for the property market? With its unique and extravagant skyline, world-class infrastructure, multicultural environment and reputation as the region’s top hospitality, shopping and entertainment destination, Dubai naturally appeals to discerning global visitors. And for ultra-high-net-worth individuals (UHNWIs), Dubai is the only city in the Middle East “that matters”, according to the annual Knight Frank Wealth Report. “Dubai’s strategic location, modern and sophisticated infrastructure and business-friendly regulations make it a popular destination for people to live in, invest and grow their wealth,” Dana Salbak, associate partner and head of Middle East and North Africa research at Knight Frank, tells PW. Dubai ranks 16th in the Knight Frank City Wealth Index 2017, ahead of cites such as Geneva, Zurich, Houston and Melbourne and just slightly behind Paris, Frankfurt, Seoul and Taipei, based on current wealth, investment, connectivity and future wealth. “With continued investment into logistics and infrastructure, we expect the city to jump up the connectivity rankings,” says Salbak. Despite its big strides as a top investment hub, Dubai continues to offer more competitive real estate prices compared with other top-tier cities such as London, New York, Hong Kong, Singapore and Tokyo. For example, $1 million (Dh3.67 million) buys 162m² of prime residential space in Dubai, while it would just buy 20m² in Hong Kong, 26m² in New York and 30m² in London, apart from the higher transfer costs and property taxes in these cities. The same trend is being seen in luxury property, albeit with wider price swings. At the top end of the market, Dubai’s most expensive penthouse in Al Habtoor City on Shaikh Zayed Road has a price tag of $54.5 million. Last year, a penthouse in New York City’s One57 tower sold for close to $100 million, only to be surpassed by another Manhattan condo currently under construction at 220 Central Park South that comes with an asking price of $250 million. The most expensive apartment in Asia was sold in December 2015 for $76.2 million in the 39 Conduit Road tower in Hong Kong. Safina Ahmad, head of residential agency at CBRE Middle East, gives another comparison: “Apartments in a new luxury development such as in London’s central district of Fitzrovia would be around £2,200 [Dh10,230] per square foot,” she tells PW. “Compare this to the luxury developments such as Viceroy Signature Residences on Palm Jumeirah at Dh2,500 per square foot or super-prime apartments in Dubai at around Dh5,000 per square foot. But it’s not just the lower asking prices that make Dubai attractive; associated costs in real estate transactions are also much cheaper. In addition, Ahmad says “Dubai is incredibly cosmopolitan with an unsurpassed lifestyle experience which appeals to the global elite”. Apartment rental returns in Dubai are also clearly higher than in the most established global property markets, even more so in the luxury segment. 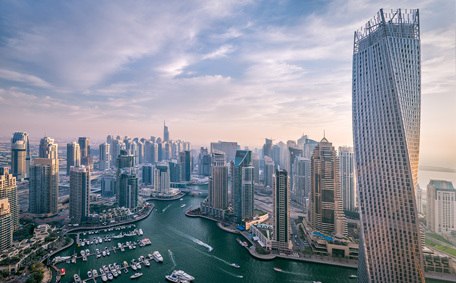 According to figures from JLL, average returns in Dubai reach 7.6 per cent, which is significantly more than average gross yields in other leading investment locations such as London (3.5 per cent), Manhattan (3 per cent), Hong Kong (2.82 per cent) and Singapore (2.83 per cent). In terms of location, certain districts in Dubai stand out when it comes to luxury property. Dubai South could also become attractive for prime property investors, particularly when the first two residential communities come on the market in 2019, driving capital value growth. “Dubai South is certainly a global neighbourhood to watch,” Salbak says. Classic luxury property destinations in Dubai are the communities of Al Barari, which features luxury villas and apartments surrounded by themed gardens and naturally landscaped lakes. Other prime areas include Arabian Ranches, Emirates Hills, Green Community, Culture Village, Victory Heights, Jumeirah Golf Estates, The Meadows, The Lakes and special developments such as Jumeirah Islands, Bluewaters Island, Jumeirah Bay, Pearl Jumeirah and The World. Apart from exclusive villa communities, luxury apartments boasting the latest amenities and spectacular views constitute a large part of the high-end properties in Dubai Marina, Downtown Dubai and along Shaikh Zayed Road. Among the latest luxury apartment developments are Harbour Gate, Harbour Views, Creek Gate and Dubai Creek Residences in Dubai Creek Harbour, Downtown Views, Imperial Avenue, Boulevard Heights and Boulevard Crescent in Downtown Dubai, Viceroy Residences, The One and The 8 on the Palm Jumeirah, and Opera Grand, Forte, Act One and Act Two in the Opera District. The latest luxury villa developments include Park Heights and Dubai Hills in Mohammad Bin Rashid City, XXII Carat Club Villas and Bvlgari Resort and Residences on the Palm, Reem in Arabian Ranches, Nikki Beach Residences in Pearl Jumeirah and Bluewaters Residences on Bluewaters Islands. However, Ahmad warns that buyers and investors need to be wary when it comes to a development’s “luxury” label. “The luxury segment is possibly one of the most fragmented areas of Dubai’s real estate market,” she explains, noting that a lot of products are being incorrectly labelled. “It is also incorrect to claim the benchmark for luxury differs from country to country. The majority of wealthy investors are incredibly well-travelled, therefore, the definition of luxury is more homogenous than ever within their community. Defining luxury is, therefore, an important yet challenging task for developers. It touches everything from the building materials to finishing and even the equipment used in amenities such as gyms and pools. For example, villa projects built with clay bricks are rare in Dubai, but they are not only aesthetically pleasing, they also provide fire and wind protection as opposed to commonly used artificial materials. In Dubai, materials such as marble and facilities such as swimming pools and gyms are not necessarily indicators of luxury, says Ahmad. “It’s incredible to see how much marble is used here in Dubai; it’s overused,” she says. “It’s the most inappropriate material one can use for kitchen worktops, yet it’s the most common. All rights reserved to the initial publisher for Ghulf news.